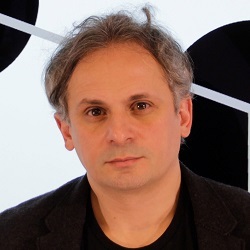 Mauro Martino is the founder and director of the Visual Artificial Intelligence Lab at IBM Research, with offices in Cambridge, US, and Professor of Practice at Northeastern University in Boston. His works have been featured in important scientific journals and conference such Nature, Science, PNAS, NeurIPS among all, and textbooks about data visualization: “Data Visualization”, “The Truthful Art”, “The Best American Infographics” 2015 and 2016 editions. Mauro is an award-winning designer whose projects received the Gold Medal at The 2017 Vizzies Visualization Challenge by National Science Foundation, Innovation by Design Award by Fast Company, Kantar Information is Beautiful Award. His projects have been shown at international festivals and exhibitions including Ars Electronica, RIXC Art Science Festival, Global Exchange at Lincoln Center, the Serpentine Gallery, London, 123 DATA, Paris.